LCF News recently caught up with LCF Cosmetic Science alumna Kristin Katakami to find out what she’s been up to since she finished her degree at LCF. Originally from Canada and now working in Australia, Kristin talks about why she studied at LCF, her favourite thing about her job and tips for prospective Cosmetic Science students. Why did you choose to study BSc Cosmetic Science (now MSc Cosmetic Science)? I studied Cosmetic Science because I loved chemistry in high school and I was working in a hair salon, where I found my love for the beauty industry. I wanted to merge my two passions together – the science behind beauty is what I am passionate about. What did you do before your Cosmetic Science degree? I apprenticed through the salon I was working at, Eveline Charles Salon & Spa, and received my Journeyman’s License as a Hairstylist. I was then studying for my Bachelor of Science degree majoring in Chemistry and I left after 2 years to start my degree at LCF. What have you been doing since you finished your degree? What is your job now? I started my career at Laleham Health & Beauty in Hampshire as a Development Chemist. I worked there for just under three years and I decided to move into a new role, new life and professional experience in Australia. I’m now working as a Product Innovation and Development Chemist at Delta Laboratories in Somersby, Australia. Do you think your course at LCF helped you to break into the cosmetics industry? The Cosmetic Science course at LCF is the reason I was able to break into the cosmetics industry with a bang! The course prepared me for every aspect of my job – to be able to work with every department and every part of the supply chain. It gave me experience and put me ahead of the game when it came to competing in the industry. 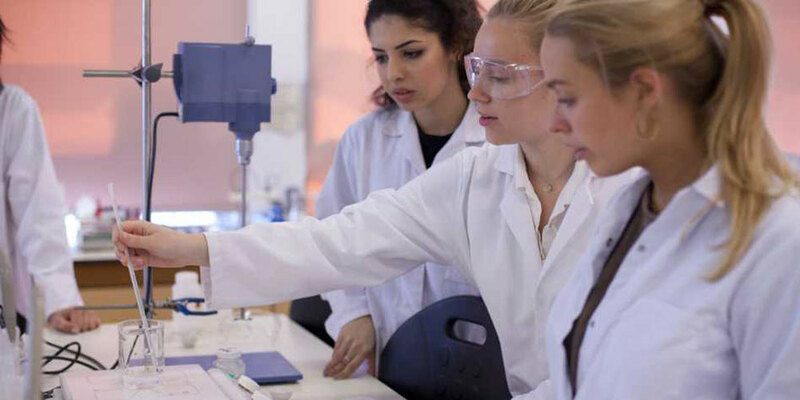 The support from the Society of Cosmetic Chemists and the tutors that work in the industry also help you break into the industry. My favourite thing about my job is seeing my product through from concept to launch and then to finally see it in the shops or in press coverage – that’s the ultimate. What has been the most interesting or exciting product you have worked on developing so far? I can’t really talk about specific products, however, the most exciting one I have worked on involved a new concept. It was a new formulation challenge and is the first product of it’s kind in the market. There is no typical day really – every day brings something new because from a technical point of view, I’m responsible from brief to launch. Responding to a brief starts by formulating options for the brand to review and approve. Once it is approved, the formulation then starts testing – it’s my responsibility to make sure the product passes all of the required tests like stability, compatibility, challenge, any claim substantiation including SPF or any other marketing or performance claims being looked at. I’m also required to check over artwork from a regulations points of view, writing methods of manufacture, manufacturing a pilot batch, overseeing first manufacture, any technical support on colour matching or the scale-up process. I could be doing any one of those things, or meeting with customers, suppliers or internal teams – all to ensure a success launch of the product and a successful performance for consumers. What top 3 tips would you give to students who want to take study Cosmetic Science? Do a placement! It gives you experience that can’t be taught, and gives you an advantage when you’re applying for jobs after graduation. You learn so much about the industry, how it operates and where you’d like to fit in it. You also learn a lot about yourself. Attendance and participation are very important. Lead team projects, participate in class, ask questions and make sure you understand the lecture before you walk away. There is a lot of information fed in all at once, and everything is relevant. It’s important to understand how it all comes together when you start working. I’ve stopped planning the ‘where’ of my future because nothing ever goes to plan – new opportunities arise and you have to take a leap. As for my career aspirations, I’d like to take my technical knowledge, commercial drive and passion for innovation to the next level. I want to manage projects, people and processes, and support and lead a technical team. I believe that the industry, the consumer and brands are looking to technical more and more. They want to understand their product, how it works and what makes it work. The science behind products is what I am passionate about and I want to take that to the brands and the consumer. With that, I want to be a well-known innovative cosmetic chemist, I want to continue to push the boundaries and create game-changing products.